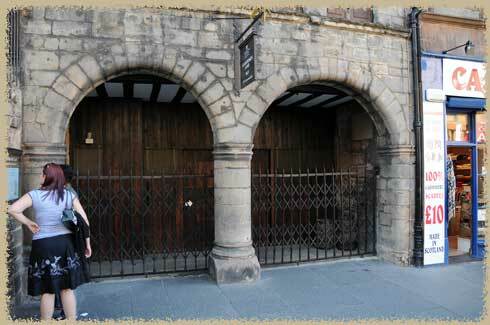 There are dozens of shops and buildings along The Royal Mile in Edinburgh -- the path leading down from Edinburgh Castle to Holyrood, but few are maintained as they were during the heydey of the city. Gladstone's Land is a tiny, narrow and impeccably restored shop. The house clearly reflects the social standing of Gladstone -- it is six stories high nad the various floors were rented out to others, while Gladstone and his family lived on the second floor and ground floor. They were considered very prosperous. Houses were cramped and small -- the only options for adding to the buildings was up, or pushing back into the narrow space they were allotted. 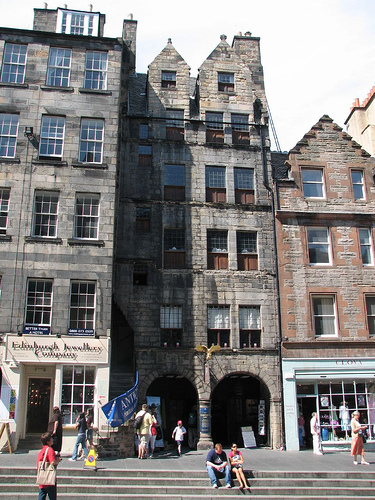 It makes the streetscape of the Royal Mile interesting -- towering, narrow facades and equally narrow and deep alleys between. It must have at one time been a much wider street, if the design of the houses here is any indication. Most have narrow spiral staircases in the back to access each floor, and the front part of the ground floor was left as an open arcade so people could walk up out of the street -- and possibly to keep livestock. Gladstone's land almost didn't make it, though. Historic Scotland saved it from demolition in the 30s, and restored the first two floors completely. THey are now open as a museum showing how a 17th century house would have been furnished, lit, and heated. The ground -floor is restored as a representative of the shops that would have lined the street, although I am unclear if the Gladstone's actuall ran a shop in this space at any time. No photos inside, unfortunately. But the interior rooms of Gladstone's Land are simple,mostly undecorated, and contain only a few pieces of furniture. Open fireplaces were used for heating, and the relatively small windows for light. ON the ceilings in the bedroom (a rather cramped affair with a poster bed) are lovely Renaissance murals. The house is surprisingly comfortable, with art on the walls, shutters on the windows, and narrow hallways and stairs. Perhaps a bit small for a modern apartment (and no running water, of course) but I could easily imagine living here amid the bustle of the center of Edinburgh.